Having just addressed an acknowledged classic, I’m getting a few days of brief reprieve before I have to return to more of that kind of pressure. That this album has been calling out to me since it arrived a few weeks back, left unlistened because it’s the beginning of the alphabet and I knew it would have its place here, only helps to ease that transition and make it a happy one. Now, I was worried enough about the person I purchased it from that I crossed my fingers and gave them a great rating as a seller, but it appears I was not wrong (it was carefully slit but otherwise still in shrinkwrap, as it was described). Of course, when it did arrive, I fell down the stairs of my apartment running to catch the postal worker who had mistakenly gathered I was not home. That was a bad week in general. It’s nice, though, to be able to sit down with an album I picked up on CD (in a similar but less showy–and far less expensive–deluxe format) around its release date. I’d intended to pre-order the deluxe vinyl, but they all sold out very quickly, and then I let the whole thing wait. The reviews rolled in as peculiar, enough to take some of the shine off, but not enough to sour me entirely. When the band was involved in a major road accident (vocalist/lyricist/guitarist John Dyer Baizley described it as their “painful test in motorcoach-aeronautics”), they dumped the tour supply of vinyl online, and I found myself late to the races again, but decided to seek out the ideal version–Shiner’s The Egg had recently arrived in my hands, also somewhat delayed, and in the limited orange colouration, but not the “ideal” orange/white split that would match the cover. 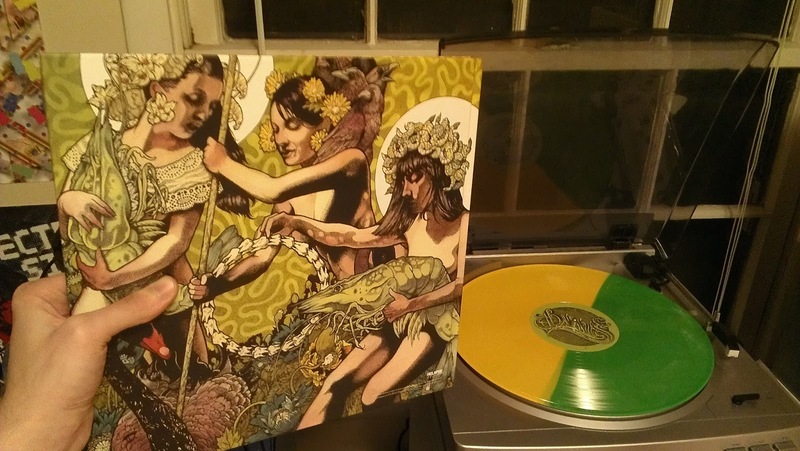 Initially, I’d thought to find the one LP green, one LP yellow edition of the album that was also released in limited quantities, but decided to sate my hunger for a split colouration and get the second most expensive record in my collection (the first is an ultra-limited edition from a run of 250 that is just kind of impressive in general, and it was a present anyway). This edition, as you have likely seen by now, is on a split yellow/green platter, or rather, two of them. When I first pulled them out, I was momentarily distressed: it appeared I had been left with two of one. But I looked closer (you can do the same) and saw the labels for each were different–a yellow label for Yellow and a green one for Green (naturally). The packaging itself is a bound hardcover “book” of lyrics and illustrations, with pockets at either cover for the actual records. It’s bound with actual string and not just glue, which I discovered as I was following along and listening to Yellow. Because this album follows Red Album and Blue Record, I’ve taken the liberty of splitting this entry into two parts below: one for each record–perhaps each is a sort of separate album to form the whole or perhaps not, (the two-as-one seems to be a common idea these days–System of a Down did it, and Coheed and Cambria are doing it right now–though in both cases the proposed, established, recorded second half appeared as a later item, rather than in an original set) but I’ve decided to treat it that way. There’s a cohesion and a sort of comfortable split between the two, and the records are distinctly labeled by colouration as I mentioned, and also within the CD and the vinyl packaging where the lyrics are printed. Each is a reasonable (if on the short side) length for an album, too. So, without any further ado, this is Yellow and Green. 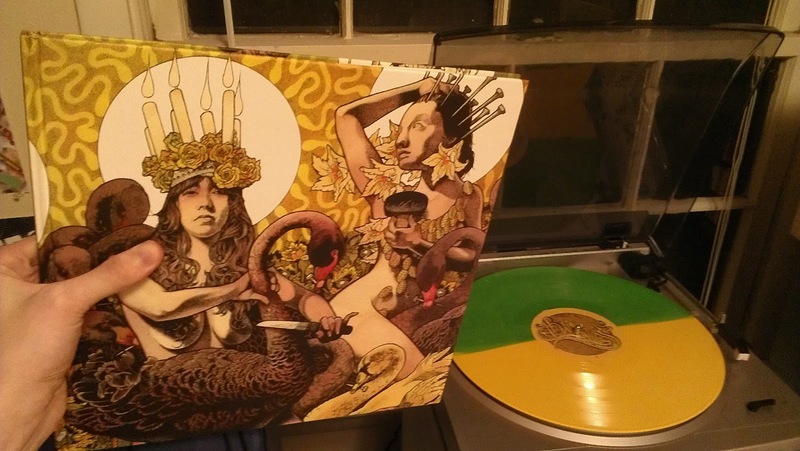 When “Yellow Theme” starts, it’s clear that one of the biggest complaints that can come out of the metal community was at least accurate regarding this album: a lot of the aggression, weight, heaviness–the metal parts–are not present on this record as they were with Red Album and Blue Record. Of course, there are instrumental introductions to both of those records, but the introduction to the first is part of a larger, much heavier song (“Rays on Pinion”), and the latter begins with “Bullhead’s Psalm” which winds up to the much heavier “The Sweetest Curse”. “Yellow Theme” fades in like “Rays on Pinions”, but it remains its own song: it is filled with the atmosphere of the whole of Yellow, a kind of water-y sound, with the vaguely distorted echo of something underwater, but absolute clarity in the heavily harmonized guitars. It’s quite pretty, really–something I’ve found is absolutely normal in metal bands, but is taken as surprising to many who aren’t familiar. When “Take My Bones Away” begins, you might be left with the impression that you are in for something heavy and abrasive, but as soon as Baizley begins singing, you realized he’s doing exactly that–singing. The riff that precedes his voice is retroactively reassigned by your brain as your expectations are violated: it actually sounds a lot more like something in that vein of heavy metal that came out of the late 60’s and early 70s–Led Zeppelin, Deep Purple, Cream–not necessarily stylistically, but with the same bent: distorted and crunchy, sure, but it still sounds like a melody to most people (or, at least, I think it ought–people surprise me in their inability to hear melodies sometimes). Baizley’s voice has a lot less edge on this album, which drains a lot of the “metal” element from the band, much to the chagrin of those hoping for that sound. Instead, we’re left with guitars that are on the lower end of sound and willing to hit on quality solos, but a chorus that is catchy and tuneful. The song itself is still a good, powerful opener that brings Yellow as close as it ever gets to metal. “March to the Sea” has the clean, harmonized guitars and meandering picking that is signature in most Baroness clean portions, even on prior albums, but shifts to a pounding bass beat and guitars played with a clever set up that makes it sound an awful lot like there’s a set of cellos hiding in there. A close listen betrays the trick–different chords on each guitar, played fast enough to sound more like a bow across strings than those of a guitar being strummed. Baizley and Peter Adams are the ones manning both instruments–or, actually, all, as Baizley covers bass for the studio recording of this album. I’d mention the surprise of Baizley continuing in his more tuneful singing style–but let’s just spoil it: he doesn’t go toward his more yell-esque vocals in basically the entirety of this release. The chorus of “March to the Sea” is one of the best on Yellow, if not the whole release. The words change each time, but manage a personification that is simultaneously obvious, familiar, and nod-inducingly thoughtful: “Valium/You left me all alone/Tell me when I will be whole again” Baizley and Adams call out in unison. There’s a deliberate bass to Baizley’s voice that seems to be a lingering vestige of the stoner/metal origins of the band, but the energy and power of that chorus, which is backed by dancing, restless fingers from Adams that climb up and down (but mostly up) the frets to push the chorus’s sound in the same direction. The start of “Little Things” almost sounds more like it will turn into an alt rock song, or something in that vein, and the addition of bass doesn’t quite dissuade this notion, even as the clarity and playing style feel peculiar for that sound. The drum beat (courtesy of Allen Blickle), however, is almost dance-like when it comes in, but it’s matched to that clean, mostly single-string guitar lick, and it shifts the two into a different space where each complements the other. It’s as if the drums are trying to lay a simple groove, and the guitars just won’t stand for it, though they won’t actually break the rhythm to do it. 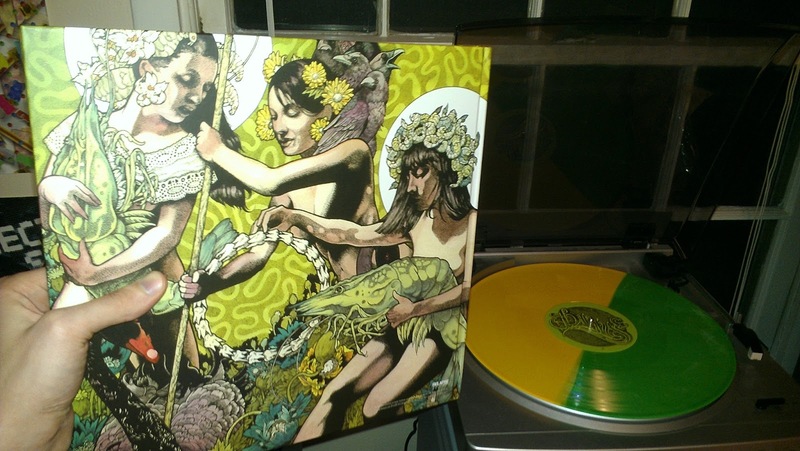 It’s actually a great sound, and drives home the feel of Baroness on the entire record. Acoustic guitars and airy keyboards define not only the introduction, but the entirety of “Twinkler”, which sounds odd and disarming at first, until you realize the missing element is any rhythm section. It is almost jarring when Baizley and Adams’ voices begin. There’s the howl of a desolate wind in the background, and their voices sound almost disembodied without anything to anchor the bottom end but a very slow keyboard (also the responsibility of Baizley). It’s an odd sound, like something from a kind of intimate spiritual ceremony–and the limited set of lyrics almost helps this notion. The second side of Yellow brings us “Cocainium”, helping to unify the growing second thematic element (drugs, if you aren’t paying attention), alongside water. Curiously, there is some sound at the beginning reminiscent of the keys in Zeppelin’s “No Quarter”, which is a phrase John actually sings at one point in the song–though in the midst of the line and in no kind of pointed way, quite believable as even a coincidence. As with the song that ends the side, “Cocainium” gives the impression of drifting calmly down below the surface of the water, the sounds warbling as if they, too, are falling down through water. Blickle’s steady bass and Baizley’s entrance on bass give the song feet, though, as if the one falling turns in the water–not frantic, but no longer allowing the water to have total control. Blickle pounds the song faster and upward–to only an increased tempo for the wavy guitar, and then an ethereal keyboard, and more of Baizley’s voice with the echoing sound of a tunnel surrounding it, both within the listener and outside; the chorus is another quality one: “Save yourself/By the way/Never ride alone”, he sings, the music turned just a bit quieter beneath him, seeming to pause just as he sings “By the way”, as if turning back and interrupting a forward movement. Distortion drops in unexpectedly, as if the one sinking is now perhaps thrashing against the water, but it slowly gives way again, until it builds a second time to a final crunch. An ominous buzz is all we hear at the beginning of “Back Where I Belong”–and we find ourselves either returned from sinking–perhaps into opiate cloudiness–and confused, vaguely cynical about it: “Tell me now/Who’s in charge here?/I thought help was on the way/It took so many years to get out of here/Now I’m back where I belong”. You can’t be sure if where he belongs is relief, resignation, or some combination of the two. The band is occasionally slapped with the label “progressive”, and this is one of the songs that tells us why, as it morphs eventually into expanding keyboard notions. Not yet lost from the water, “Sea Lungs” is a description of loss in the face of unexpected entrapment. There’s a kind of renewed strength, “And when my ship comes in/I’ll find a way to breathe again” But it’s followed by a call from the ocean itself to relent and let the water rush in: “Breathe in deep/Let the sea fill your lungs/Better to brace for death/Than die for a promised land”, and we know that it is the ocean itself, not just because it tells us (as it does in the next lines), but because a quaver electronically modifies Baizley’s voice. Still, the final call is to find that way to breathe again, though it’s only after it comes unglued for a moment, the guitar seeming to spring off alone into the deep. The flip of track number balancing between sides of Green and Yellow appeals to some kind of sensibility I have: there’s a mirror imaging to this. But the music itself? Not quite so much a mirror as an alternate world. While the drifting, murky, aquatic feel of Yellow might lend itself toward any number of things, the tense whine that begins “Green Theme” seems appropriately dark. And yet, when the guitars and (faint) drums appear, it’s bright and warm, if relaxed and easygoing. And then it explodes: rock guitars, not metal ones, emphatic drums and splash cymbals–like an anthem, stern but cheerful and appreciable. But it’s only a momentary lapse–the guitars slip back into their clean, ringing sound, but they don’t let that anthemic, stomping riff go. It’s a moment like you expect from a solid, slightly-arty (but not full “art-rock”) band–that sort of “epic” feeling, if you’ll pardon the use of a word that now has a memetic colloquial meaning not in line with that which I use it for. The drums then carry the lighter guitars aloft, no longer muting themselves like the guitars–but the buzz and whine taking over: no longer dark, but still quite dissonant. This doesn’t tell us much about where “Board Up the House” will take us, nor do the mumbled female voices and growing distortion. And when the song actually catches us, it’s not where it seemed to go, but it is where it went, and there’s nothing jarring about it: a riff that feels half-familiar, staying low, but spiking into higher pitches on each repetition, the rhythm pounded out. But we know Baroness by now–this might all just be introduction for something else. And yet, Baizley’s voice comes in, and we know we’re now comfortable in ascribing a sensation to the song in general. The lyrics don’t seem to lend themselves to the continued anthemic sound: “Board up the house/Hide your boys and girls”, but they are what Baizley sings, in a voice that stays on the pleasant side of tune, descending in a spiral. It’s very far from metal, darkness, or anything that even Yellow, let alone the word “metal” might imply. Harmonics are, for all their sort of peculiarity (they involve fingers on guitar strings without real pressure, barring the “fake” varieties and some other “cheats”) are a common thing, and they are used to introduce “Mtns. (The Crown & Anchor)”. Swirling, ringing guitars are the order of the song, but they are matched to the slightly modified (it sounds like a strain of autotune mixed with turning the volume up loud enough to distort) vocals Baizley applies–how did this come out of a band known for stoner rock, on a label like Relapse? I don’t honestly know, but by this point, I was more and more glad I’d gotten to sit down and focus on the album. And we have “Foolsong” to close out the side–we’ve not yet really lost the cheerier sound that started Green, even as we now have a song about “The fool who digs his own grave”, but it seems like a final resignation to even a self-dug grave: “It’s too late to ignore the storm up ahead/It’s too dark to see my way out/Now all I can do about anything wrong/Is dig further down”. The words are dark, they’re resigned to suffering and ends, but they aren’t sung or played against anything that fits with this. It’s not like there is a happiness about this prospective movement, it’s as if it’s an acceptance of poor choices and the ramifications of them. When “Collapse” opens the final side of the entire set, and it generalizes the tone of “Foolsong”: “We are all soured milk/When we look in the mirror, we collapse/When the time has come/When our finger’s on the trigger, we collapse”. We’re all weak, we’re all corrupted–yet, again, the sound is not cheerful, but it isn’t dark or sad. The guitars quaver and fold in on themselves thanks to an effect, and Baizley’s voice has lost its spark, but it’s still clear and pretty–with the only real hint of sadness present. It’s a surprise to hear the start of “Psalms Alive”: an electronic drumbeat, soft, taps away like Morse Code behind keys and guitar that echo and reverberate, and then the voice we hear has regained its spark, and even some energy and aggression. It’s a call of impotence on the narrator’s part, as well as admonition of its addressee, for filling their palms “with dirty bombs, instead of hand grenades”. It sounds almost as if the real crunch will return, but it doesn’t: distortion comes back, but it sounds more like a rock band, perhaps a post punk band, but nothing overbearing. Baizley has energy for the first time in many a song, at least, the first to have this kind of energy: passionate, frustrated, maybe even angry. But after a delightful solo, it dissipates, and we have only waves of melody, which lead us to the easy acoustic duet of “Stretchmarker”. Adams and Baizley play off each other, finger picking, and Blickle submits only a bass kick beat and a shaker to back them, not to drive anything, just to keep the sound full. The song is absolutely beautiful, especially as it opens to feature a single acoustic over everything else, but the second no slouch and answering it wonderfully. Feel the light of day. Feel it fade away. That final stanza is the chorus, and it’s another magnificent one. The way Baizley sings these is not in the way I’ve heard anyone else sing anything: he’s not a trained expert with amazing range, he’s not a character–it’s something in the way he seems to do everything. The cover art is his as well, which is not unusual, he has also done art and covers for Kylesa, Torche, Black Tusk, Darkest Hour, and even Gillian Welch. His style is incredibly distinct: firm, clear, inked lines, a focus on the female form as a guidepost for the viewer, patterns and water colours, and simultaneously stiff and living art. The inks give it a static, absolute position, yet the way the lines are drawn, the colours are painted, the reality of the proportions–it’s as if it were a perfectly captured moment. And that’s what his vocals are, and that’s what his lyrics are: they are art, and they are poetry, and they are brilliant singing–but they aren’t perfection of any of these, they aren’t the most technically complete, or words you would teach in a poetry class alongside established poets. They just don’t falter despite this: they are refined in their “non-expert” stature. There’s no feeling of awkwardness, there’s no feeling of that amateurishness that can make some things unbearable and other things charming. And yet, it isn’t sterilized in this either; everything he does as art congeals correctly–maybe not perfectly, but as it should for what it is, be it album art, words, or vocal. And it’s best that I established those while I could, for the closing track, “If I Forget Thee, Lowcountry” is instrumental. It is a final return to warmth and brightness, like a comfortably breezy day in an isolated field of tall grass, laying back and sleepily taking it in–conscious, but not hurried even in thought. Is it acceptance of the fallibility of man, self, and the willingness to choose an easy or self-destructive path, finding comfort in this? Or is it just taking a final moment of respite to escape even that, let alone the pressures that might lead to it? Either way–or any other way–it lets Green drift off lazily into neither darkness nor sunset, nor even full sun, beating down. There are a few final thoughts to leave here. Baroness is one of a handful of bands that I found via status as opening act for a band I saw live, though they are actually one of a more unique pair: Baroness and Kylesa (who have more in common than this, even for me personally) were both to open for Mastodon, the two times I failed to go through with plans to see Mastodon. Both have, curiously, taken over my listening far more than Mastodon. I found myself, though, breezing through Yellow and Green in the past: it was a double album, two discs, nearly two hours of material, and I wanted to hear all of it. I couldn’t easily make that a short car trip to work, or anything else of the kind. This sort of listening is what it demands, though, and is some of what I take out of this experience: the chance to sit and focus on something I might not otherwise have given the chance it deserved. I don’t like using some words in talking about music, because they are loaded. I’ve already mentioned that at least a few people I know avoid metal quite readily, but this is far from it. Indeed, as I hinted, many were upset at how far from metal it is. There are easy attempts to align it with understood genres–progressive rock, classic rock, hard rock, so on–but it fits in the niche that Baroness themselves carved. Red Album led the way to the increased instrumental and acoustic passages of Blue Record, and it led on into this: a realization of all the aspects of music that clearly interest Baizley, Adams, and Blickle, but without the expected, slavish devotion to aggression and speed that some metal fans demand. It’s a very pretty record, one I’ve got to say deserves your time, even if you’ve never heard of them, or the word “metal” makes you wary.